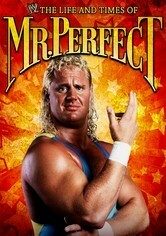 Discover the man behind the nickname with this portrait of Curt Hennig, aka wrestling's Mr. Perfect. Hennig displays the skill that landed him in the WWE Hall of Fame in footage from some of his greatest WWE, WCW and AWA matches. These clips are combined with interviews with fellow wrestlers, friends and family -- including his father, retired AWA superstar Larry "The Axe" Hennig -- that reveal the man as he was in and out of the ring.